okay not really, but when I got dressed for brunch on Saturday, I based my outfit around the bright colors in my shoes. It was actually sunny this weekend in Seattle... like REALLY SUNNY!!! And wearing bright colors like this felt like a celebration! Like Spring! ALMOST! I was also happy, because although I was drawn to these shoes, I had absolutely NO idea what I would pair them with. But I thought this worked out rather nicely! 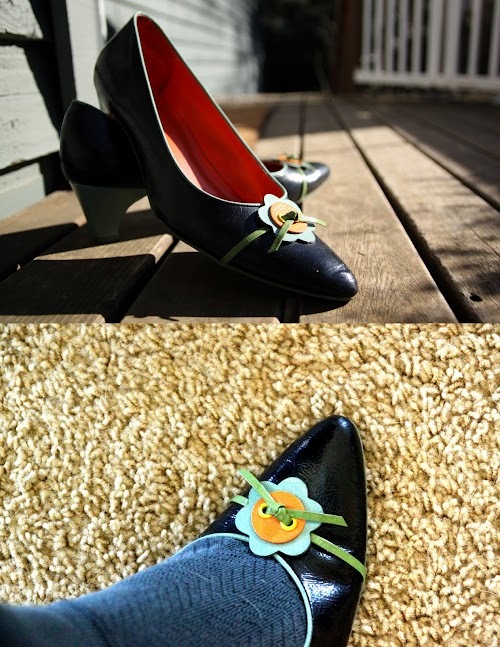 (the main color of the shoes is actually navy, although it looks black in these photographs). I've been wanting to wear this vintage bright orange wool skirt for awhile. My husband thinks it fits better than pencil skirts nowadays, because maybe way back when (whenever this skirt was made) skirts might have been made for women with smaller waists and larger hips. 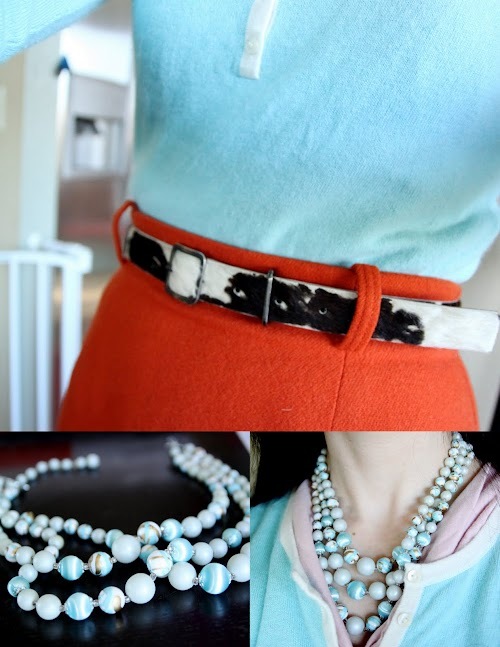 I love how the light turquoise of the sweater just pops off of the orange of this skirt. And, because this is a heavy (like REALLY thick) wool skirt and it's lined, it keeps me warm!! Huzzah! That skirt is such a great color and I adore the combination of the orange and turquoise. You really look fantastic! That's a great outfit! And those shoes are adorable! Gorgeous color combo and love the shoes! I LOVE this outfit! Especially the skirt, you look great! Love those shoes Lori - they're really cute. I also love how you coordinated the colours of your outfit to go with the trims on the shoe! Nice skirt too! I know what you mean about belt hoops. I have a love hate relationship with mine! These colors are so awesome and perfect for a sunny seattle day! Orange and Blue is both daring, feminine and refreshing. The combination certainly pairs well with those fabulous shoes. I like the belt loops. I don't have one single pencil skirt with belt loops. Although I normally wear a belt with them. Budz is looking good. Bakersfield is expecting SNOW this weekend. I'm not holding my breath. Oh my goodness -- this might be one of my favorite outfits that I have seen you wear, Lori. The skirt fits you to a tee, and the color is so rich and robust. And the turquoise keeps it fresh, modern, and spring-like.